Noelene Lutton presents the March showcase at the Guild Office at 10am, Friday 7 March 2008. After completing a 4 year textile course before she was married, Noelene has always been interested in all forms of craft and sewing. As a needle in hand is her form of relaxation, patchwork became Noelene's passion about 10 years ago. Noelene describes herself as a very traditional quilter with hand piecing and needleturn applique featuring in most of her quilts. Entries for the Sydney Quilt Show 2008 close TOMORROW, 29 FEBRUARY. If your forms are still sitting on your sewing table (or you need to download the entry form), complete them and stuff them into an Express Post envelope and into the mail box NOW. A don't forget to include your volunteer form (download). take down (5.00-7.30pm Sunday, 15 June). For set up and take down, we are also looking for some strong young men (under 60 years is good!) to supplement the "Old Faithful" team of husbands that turn up every year. 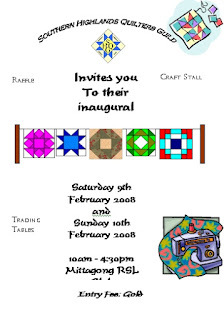 Visitors to the Newcastle Craft & Quilt Fair (29 Feb - 2 March 2008) will have an opportunity to view 50 spectacular art quilts from the Husqvarna Viking International Quilt Competition - Imagine That! These quilts are in Australia for a short time only as part of a world tour and come from countries such as Israel, France, Japan, Germany, Hungary, the USA, the UK, Australia and Canada. 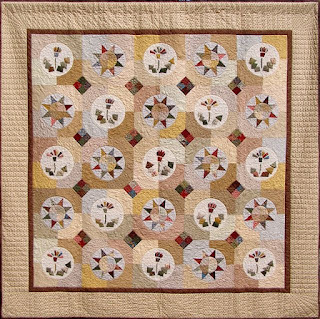 PS: If you downloaded the code for the Quilt Show 2007 button, you will see that it has been automatically updated to display the 2008 button - no further action required! This year the "Away Meeting" will be held at 1pm on Saturday, 5 April 2008 at the Bocce Club at Malua Bay, 12 kilometres from Batemans Bay. The guest speaker will be Robyn Ahern, editor of Patchwork & Stitching magazine sharing over 20 of her own quilts together with a selection from her antique quilt collection [updated 12 March]. The Guild is proposing a coach trip from Sydney for a weekend of quilting, shopping and fun. There are 60 spaces available on the coach and the Guild hopes to fill them all. To assist with planning, please let the Guild office know if you are interested in joining a coach from Sydney for a fun weekend excursion. Tel: (02) 9283 3737 or e-mail. These quilts are featured in a striking 2008 calendar. The Guild has a limited number of these calendars left and is offering them at the reduced price of $10. Buy ten and the Guild will pay for postage within Australia. And if you are signing up as a new member*, you will get one FREE! Contact the Guild office to arrange your purchase. *New member is defined as either totally new to the Guild or a person who has not been a member during the three year period immediately preceding their membership application. Australian quilters are invited to be part of the World Quilt Competition. 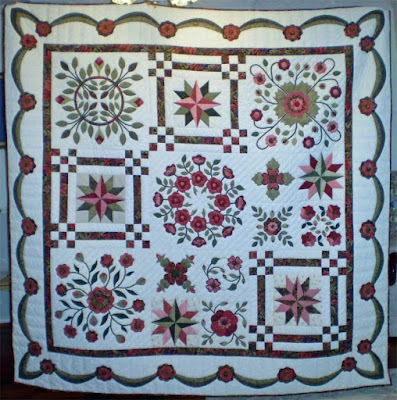 2008 entry forms are available from Australian World Quilt & Textile coordinator Sue Dennis. Send a business size SSAE to 31 Shelley St, Sunnybank 4109 QLD or down load from www.suedennis.com.au Entry submission deadline is mid May, notification mid June and delivery of quilts early July. Cash prizes are given for traditional & innovative quilts and include awards for Best of World, Best Use of Colour, Best of Country- first & second & Viewer’s Choice. In 2007 Australians (and Guild members!) Eileen Campbell was awarded Innovative Best Machine Workmanship and Esther Aliu- Traditional Best Machine Workmanship with Best of Country Australia awarded to Marlene King and second Clare Fairless. 10 countries were represented. The World Quilt Competition 2008 will be exhibited in Manchester New Hampshire, the Pacific International Quilt Festival Santa Clara California & the Greater Chicago Quilt Exposition. At the 9 February general meeting at Burwood, Judy Hooworth shared a selection of quilts from her latest book Quilts on the Double co-authored with another Australian designer and Guild member Margaret Rolfe. 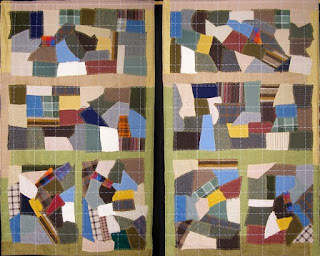 The book sets out an ingenious method of transforming a group of strip sets into two terrific quilts. afternoon shopping at Mittagong and return to Sydney. Cost: $320 twin share accommodation or $386.00 for a single room. All meals included except morning tea Saturday and afternoon tea Sunday. 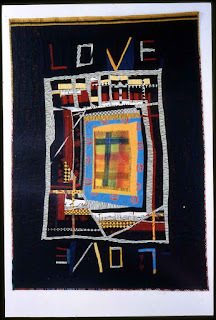 In addition the the new quilt 2008, the Manly Art Gallery & Museum is currently presenting Judy McDermott: Speaking For Themselves, a retrospective exhibition of quilt textiles by Judy McDermott (1937-2004) whose work crossed art/craft boundaries and challenged social ideologies which went beyond the medium of the quilt. If you have not yet purchased you 2008 calendar then you are in luck! The Guild has a limited number of their 2008 calendar left and is offering them at the reduced price of $10. Buy ten and the Guild will pay for postage within Australia. And if you are signing up as a new member*, you will get one FREE! Contact the Guild office to arrange your purchase. *New member is defined as either totally new to the Guild or have not been a member during the three year period immediately preceding their membership application.